Update July 14 2013 at bottom of page. 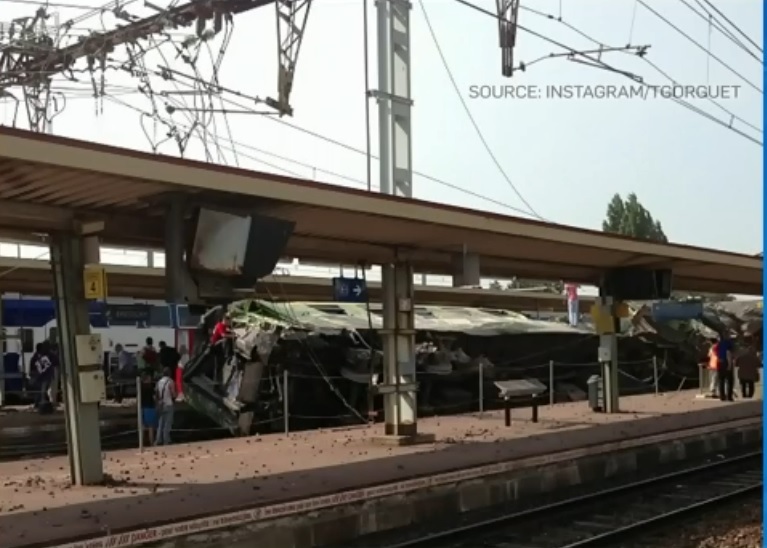 PARIS — A packed passenger train derailed and crashed into a station outside Paris on Friday on the eve of a major holiday weekend. At least seven people were believed killed and dozens were injured, authorities said. 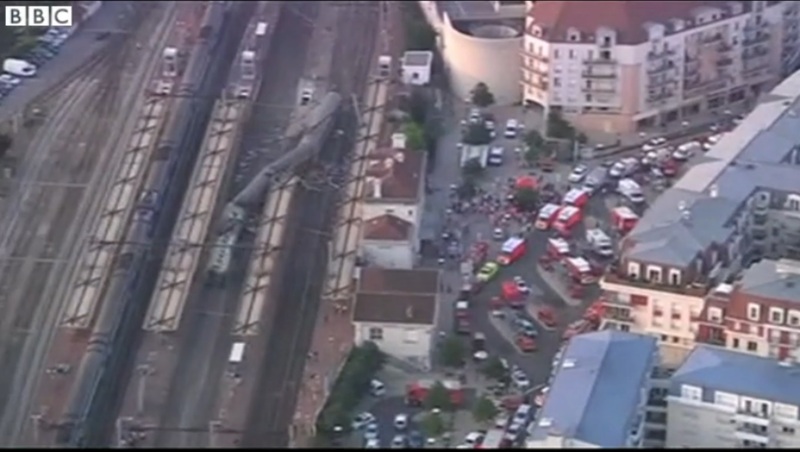 The crash at Bretigny-sur-Orge station was the deadliest in France in years. Some cars slid toward the station itself, crushing part of the metallic roof over the platform. Images from the scene shown on French television showed gnarled metal and shards on the platform, and debris from the crash clogging the stairwell leading beneath the platform. “Some cars simply derailed, others are leaning, others fell over,” he said. The SNCF said the train was carrying about 385 passengers when it derailed Friday evening at 5:15 p.m. and crashed into the station at Bretigny-sur-Orge, about 20 kilometres south of Paris. The train was headed from Paris to Limoges, a 400- kilometre journey and was about 20 minutes into what would have been a three-hour journey. 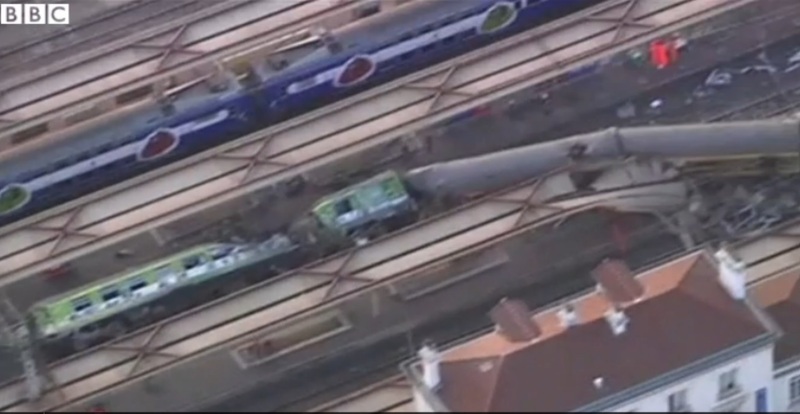 All trains from Paris’ Gare d’Austerlitz were suspended after the accident. A passenger speaking on France’s BFM television said the train was going at a normal speed and wasn’t meant to stop at Bretigny-sur-Orge. He described children unattended in the chaotic aftermath. He said there are swarms of emergency workers at the scene. Video at the Source as well.Death toll has been lowed from 7 to 6. Death toll remains at 6. The town has seen some of the deadliest fighting of the campaign. More British soldiers have been killed there and more medals won than anywhere else in Afghanistan. But the benefits the British troops have brought are seized on by officials, including decreased opium production and more Afghans being educated. But the benefits have come at a price, not all of which are as obvious as the monuments to the fallen British soldiers erected by their comrades. Shortages of helicopters and surveillance equipment mean troops are only as safe as far as they can see with their rifle sights or binoculars. The Taliban also know it and are careful to lay their lethal mines and improvised explosive devices just out of sight. Soldiers work on the basis that every time they patrol there is a one in four chance one of them will die. Privately, senior British officers say they currently work on the assumption at least a “limb a day” will be lost. The tally of dead currently stands at 208, but some senior officers believe this could rise sharply. The numbers of those wounded and maimed have soared by 300 per cent in the past three years as the increasingly bloody struggle to maintain order has intensified. New figures obtained by The Independent on Sunday also show that the numbers claiming compensation for injuries sustained in Iraq and Afghanistan are more than 12 times higher than the total in 2005. Unpublished figures from the Armed Forces Compensation Scheme (AFCS) reveal in disturbing detail the “hidden costs” of the military action, with soaring numbers being forced out by wounds. The number of soldiers applying to the AFCS for financial assistance after being medically discharged rose from 200 in 2005-06, when the scheme opened, to 845 last year. Troops claiming for injuries suffered in service rose from 240 to 3,255 during the same period. The disclosures follow revelations last week that service chiefs expect the number wounded in Afghanistan to have doubled by the end of the year. The total to the end of July was 299 – compared to 245 in the whole of 2008. The figures also show that the numbers of “post-service” claims has risen by a factor of almost 100, from 15 to 1,455 since 2005. A Ministry of Defence spokesman admitted the heavy toll is due to the number of people experiencing post-traumatic stress disorder (PTSD) after leaving the services. PTSD sufferers tell of how traumatic memories come back regularly and involuntarily, resulting in chronic anxiety and hyper-alertness. The numbers affected are contentious, but conservative estimates say that tens of thousands of British troops who have served in Afghanistan and Iraq are suffering. The MoD’s latest assessment of psychiatric health problems within UK forces, completed late last month, showed there were 3,181 new cases of “mental disorder” in 2008 – 16 cases for every 1,000 personnel. Troops who had been deployed to Afghanistan or Iraq showed high rates of “neurotic disorders”, including PTSD, with the Royal Marines affected more than all the other services. The MoD acknowledges the high rates of mental health problems caused by military operations. In documents, seen by the IoS, officials concede that “some personnel returned from operations with psychological problems particularly when tour lengths exceeded expectations”. The MoD has appealed for increased “X factor” payments, which recognise the extra difficulties faced by service personnel. Critics insist it is too little, too late, and fails to acknowledge the scale of the problem. Lord Guthrie, the former head of the Army, said the authorities had been slow to recognise the problem’s scale and extent. “When we go to war, we just don’t have the wherewithal to look after the physical and mental needs of our service people. You have to make sure that when you go to war, you are prepared to look after people, and that hasn’t happened. “Successive governments have had a very poor record and have cut, cut and cut again the care for our service people. Having to rely on the NHS is not good enough. It has no capacity to deal with the extra people who need medical attention, and all this has been compounded by the reluctance of the MoD to admit how big the problem is. “We hear a lot about the dead, but rather less about the wounded. We haven’t been able to see the proper figures,” he said. James Saunders, 39, served in the first Gulf War in the Royal Artillery. Looking back, he was suffering from PTSD when discharged in 1993, but he believes the Army was glad to close the door on him and his problems. Former SAS trooper Bob Paxman, 41, said veterans’ problems are exacerbated when they leave the forces and are “out of the family”. His GP “didn’t have a clue” where to send him and specialised counselling failed. He suffered a total breakdown in 2006. “I was on a dangerous job in Africa. I was a total wreck, at rock bottom. If I was left alone for more than five minutes, the flashbacks would come big style. So I self-medicated and filled myself with as much booze as possible. One night, I sank a bottle of whisky and put my 9mm pistol in my mouth but I couldn’t pull the trigger,” he said. After his experiences Mr Paxman helped set up the charity talking2minds to help others with similar problems. Combat Stress is another charity which has stepped into the vacuum created by the MoD and the NHS. It is helping around 4,000 ex-servicemen and women with combat-related mental health problems. in the Falklands, Northern Ireland and the first Gulf War; less than 10 per cent have served in Iraq or Afghanistan. Hundreds more are treated in private hospitals ever year, paid for by the NHS. David Hill, Combat Stress’s chief executive, said: “The scale and size of the problem is not known and is not adequately mapped in the UK – unlike the US and Australia. We are currently seeing an unprecedented increase in demand. Since 2005, there has been a 66 per cent increase in referrals and we are already providing support for 316 veterans of recent conflicts.” He says the NHS has no accurate figures on its veteran patients, and without such figures, no effective planning can be done. The looming extent of problems created by Afghanistan has prompted the US to act. Earlier this month, it announced controversial plans to train all 1.1 million of its soldiers in emotional resilience. The training, the first of its kind for any military, hopes to prevent mental health problems from developing by helping soldiers to recognise and cope better with stressful situations in combat and civilian life. The $117m (£72m) scheme, to be rolled out by next summer, is unproven but the rising rates of suicide, PTSD and substance misuse has convinced military commanders to try it. James Saunders, 39, from Hampshire, joined the Army aged 17. Three years later, he flew to Iraq and spent six months fighting in the first Gulf War where he was involved in a terrifying friendly fire incident that injured five soldiers. On his return, his life spiralled out on control and he sought, and got, a discharge in 1993. It took another 12 years for him to find the psychological help he needed. “We would drive down Basra Road, looking at the carnage left behind by allied air forces. It was like a slow motion film with body parts everywhere, sitting in cars. These images were burnt into my memory. “When we flew home, a sergeant handed us all a piece of paper which said that we might experience problems with relationships. I was 21; I laughed and threw it in the bin. Eighteen months later, my son was stillborn and that sped up the self-destruct train. I ruined my relationship; cut myself off from family; I was taking every drug you can think of; went awol for months and eventually ended up in prison. I met at least six other army guys inside, all with similar problems, but there was no help. “It wasn’t until a friend told me about Combat Stress four years ago that like so many guys, I realised I had PTSD. More times then not, someone is watching their comrades dieing. That leaves a long term memory of sorrow and loss. They may even be holding them in their arms as they die. Each year the number of casualties are risisng. The spin doctors try to make us believe things are getting better in Afghanistan, when in fact they are deteriorating. They are helping Afghanistan are they? Well I don’t see any improvements. What you don’t hear much about in the News Media. Unemployment rate In Afghanistan: No improvement there? Infant Mortality Rate is Rising: No improvement there? Literacy Rate is Declining: Improved a bit for 5 years and is now below the 2000, 15% . No improvement there? Afghan Poverty rates are rising: No improvement there? Afghans fit for Military Service: So one has to wonder, how many may decide to fight against NATO forces? They are seeing their friends and family die at the hands of NATO. There have been over 56,000 Afghan Civilians injured and over 8,000 who have died because if the war. 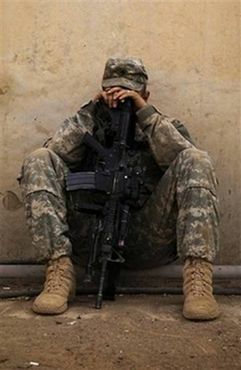 They to suffer from all the same things soldiers suffer from as well. The numbers on both side are growing. Al Jazeera’s Zeina Khodr reports from Kabul. Within the first 6 months of 2009 over 1,000 Civilians were killed. Since then many, many more have died. Things have escalated in Afghanistan since the arrival of the troops from the US. The US is not wanted there. The number of soldiers who die and get injured have risen as well. Even the recent election was fraudulent. So what are the soldiers dieing for? Certainly not for “democracy” that is just a sham. Something the spin doctors like to feed the public. “We are making progress” something else the spin doctors like to feed the public. The spin doctors tell us “Our soldiers die for a noble cause”. What a crock. They actually want to control the middle east and it’s people. They want to control the resources of gas and oil. That is really why men, women and children are dieing or becoming severely injured, civilian or military makes little difference. Lost arms, lost legs, lost eyesight, mental health problems are just a few of the injuries that occur. Permanent injures that last for the rest of their lives. On both sides there are thousands upon thousands of victims who will suffer for the rest of their lives. Where do we draw the line? When do we say enough. Usama Bin Ladin has never been connected to 9/11. So why is NATO in Afghanistan? NATO aircraft opened fire on hijacked fuel trucks in Kunduz, Afghanistan before dawn on Friday September 4 2009, killing as many as 90 people in an incident that could trigger a backlash against Western troops. NATO initially said it believed the casualties were all Taliban fighters, but later acknowledged that large numbers of civilians were being treated in hospitals in the area. 90 victims died and numerous ones were injured. Below are just a few of the injured. September 7 2009 Child being treated in hospital. An Afghan villager injured lies in hospital after Friday’s NATO air strike on a Taliban target in northern Kunduz September 4, 2009. Afghani policemen look at one of two burnt fuel tankers, near Kunduz, Afghanistan, Friday, Sept. 4, 2009. Local Afghani people burry their villagers killed in a NATO air strike, in a mass grave near Kunduz, Afghanistan, Friday, Sept. 4, 2009. Two American soldiers are escorted a detainee in fob Robinson who is going to be flown back to Kandahar base in a Chinook for further questioning. Private Dan Burris of the 82nd Airborne’s 1/508 Parachute Infantry Regiment, Alpha Company, Third Platoon kicks in a door after staging a nighttime air assault into Sangin, Helmand province, the largest air assault in Afghanistan since the beginning of the war, on Thursday, April 5, 2007. If it wasn’t bad enough there is a war they also had two earthquaks as well. The bags that are put on prisoners is cruel and inhibits breathing. Afghanistan has suffered many casualties. Many children have been killed and many injured. Their injuries are extreme. These are the pictures you will never see in our mainstream media. This is the true face of war in Afghanistan. Israeli naval boats fired at the Gaza coastline, causing some damage. Israeli F-16s flew over Gaza, causing schools, government offices, and banks to close and causing Egypt to rapidly evacuate all of its personnel from the Rafah crossing in fear that an attack was imminent. At 7.30 am Jan. 22, five days after Israeli authorities declared a ‘ceasefire’ following their 22-day air, land and sea bombardment of the Gaza Strip, Israeli gunboats renewed shelling off the Gaza city coast, injuring at least six, including four children. Mu’awiyah Hassanain, director of Ambulance and Emergency Services, reported more shelling in the north-western coastal area As Sudaniya the same morning. Five fishermen were injured in the attacks, he said. About 9.45 am that morning in Sheyjaiee district to the east of Gaza city, seven-year-old Ahmed Hassanian was outside his house with friends when Israeli soldiers fired from the eastern border. A bullet lodged in his brain, causing brain haemorrhage. Dr. Fawzi Nablusi, director of the ICU at Shifa hospital, says the boy is not expected to survive. Three Palestinians have been killed since the ceasefire and 15 injured, including the ten injured Jan. 22, according to both Mu’awiyah Hassanain and Dr. Hassan Khalaf. Hours after the ceasefire was said to have come into effect Jan. 18, Israeli warplanes flew extremely low over areas of Gaza. Drones capable both of photographing and of dropping targeted missiles continued to circle overhead. At 8.30 am Jan. 18, one of these drones dropped two missiles in the Amal area east of Beit Hanoun, killing 11-year-old Angham Ra’fat al-Masri and injuring her mother. The Palestinian Centre for Human Rights (PCHR) reports further violations of the ceasefire, including the killing of Maher abu Rjaila, 23, shot in the chest by Israeli troops at 10.40 am Jan. 18 as he walked on his land east of Khan Younis city. Israeli soldiers fired on residents of Al-Qarara, near Khan Younis, at 1 pm Jan. 20, shooting Waleed Al-Astal, 42, in his right foot. In Shifa hospital, Yasser Abed, 15, from Gaza’s Beach camp, explained how he received a shard of shrapnel in his forehead. “I went out of my house to see what was happening,” he said. “I didn’t see the gunboat, didn’t see anything.” His father explains that Yasser was rushed to Shifa after the shrapnel hit him, and that there was a girl nearby aged about four who was also hit by a piece of shrapnel. In another room at Shifa, 11-year-old Nisreen Al-Quqa tells how she was out walking on the beach with her brother when the Israeli navy began to fire upon Palestinian fishermen. A piece of shrapnel from the shelling got lodged in her right calf muscle. “What ceasefire?” the girl’s mother said, looking down at her daughter. But she knows Nisreen is lucky to have only a minor leg injury; it could have been much worse. Others injured after the ceasefire include a 14-year-old boy hit in the thigh by shrapnel fragments, and a 35-year-old man also with shrapnel injury. Israel‘s assault on Gaza killed at least 1,330 people, with as many as 200 more bodies expected to be recovered from under the rubble of more than 4,000 destroyed houses and 20,000 buildings. Ninety percent of the cases in Shifa’s ICU are civilian, and of these half are women and children, says Dr. Fawzi. Ceasefire violations are not new. During the six-month ceasefire that began Jun. 19, Israeli forces killed 22 Palestinians, many of them members of resistance groups. Thirty-eight fishermen and farmers were abducted. Israeli soldiers routinely fired upon fishermen and farmers along Gaza’s eastern and northern borders, injuring 62, according to Palestinian sources. OSLO: Some 100 countries will ban the use of cluster bombs with the signing of a treaty Wednesday in Oslo but major producers such as China, Russia and the United States are shunning the pact. The treaty, agreed upon in Dublin in May, outlaws the use, production, transfer and stockpiling of cluster munitions which primarily kill civilians. “It’s only one of the very few times in history that an entire category of weapons has been banned,” said Thomas Nash of the Cluster Munitions Coalition (CMC) umbrella group that comprises some 300 non-governmental organisations. It’s unlikely now that you’re going to see large scale use of cluster bombs,” he said. Dropped from planes or fired from artillery, cluster bombs explode in mid-air to randomly scatter hundreds of bomblets, which can be three inches (eight centimetres) in size. Many cluster bomblets can fail to explode, often leaving poverty-stricken areas trying to recover from war littered with countless de-facto landmines. According to Handicap International, about 100,000 people have been maimed or killed by cluster bombs around the world since 1965, 98 per cent of them civilians. More than a quarter of the victims are children who mistake the bomblets for toys or tin cans. “This is not about disarmament, this is not about arms control. This is a humanitarian issue,” said Annette Abelsen, a senior advisor at the foreign ministry in Norway which played a key role in hammering out the international agreement. In Laos, the most affected country in the world, the US Air Force dropped 260 million cluster bombs between 1964 and 1973, or the equivalent of a fully-loaded B52 bomber’s cargo dropped every eight minutes for nine years. Dispersed in fields and pastures, the weapons make it perilous to cultivate the land and can claim numerous lives for decades after the end of a conflict. On Wednesday, France and Britain will be represented by their foreign ministers, Bernard Kouchner and David Miliband. Japan, Canada, Germany and Australia will also sign the treaty. But, as was the case with the Ottawa Convention that outlaws landmines, key countries such as the United States, Russia, China and Israel have objected to the ban and will not sign it because they are the biggest producers and users. The election of Barack Obama as president may however bring about a change in the US position, activists hope. “Obama has voted for, previously, a national regulation in the US for cluster ammunitions,” said Grethe Oestern, a policy advisor at the Norwegian People’s Aid organisation and a co-chair of the CMC. “So that’s not just a theoretical possibility at all that we could see the US onboard this treaty sometime in the future,” she added. In 2006, Obama voted in the US Senate to ban the use of cluster munitions in heavily populated areas, but in the end the motion was rejected. The Oslo Convention is nonetheless expected to stigmatise the use of the weapon even by non-signatory countries, according to activists. While the United States, Russia and China “seem to have an allergy to international law in general,” there are signs that “the stigma against this weapon is already working,” Nash said. NATO’s decision not to use cluster bombs, including in Afghanistan, and the lightning-quick denial from Moscow when it was accused of using the munitions against Georgia in the August war shows that these countries also find the weapon “morally unacceptable,” Nash said. The European Parliament on Thursday urged European Union (EU) member states to sign and ratify the Convention of Cluster Munitions (CCM) as soon as possible and to take steps toward implementation even before it is signed and ratified. The resolution was adopted with 471 votes in favor, 6 against and 21 abstentions in Strasbourg, France. The European Parliament requests EU member states not to use, invest in, stockpile, produce, transfer or export cluster munitions even though the CCM has not entered into force. EU member states which have used cluster munitions are called on to provide assistance to affected populations and to provide technical and financial assistance for the clearance and destruction of cluster munitions remnants. The European Parliament urged the European Commission to increase financial assistance through all available instruments to communities and individuals affected by unexploded cluster munitions. Cluster bombs scatter over a wide area when dropped from the air or used in artillery shells. Many do not explode and it is often children who pick them up, with devastating consequences. The charity Handicap International estimates that 98 percent of the victims of cluster bombs are civilians, of whom 27 percent are children. EU member states are also requested to refrain from taking action, which might circumvent or jeopardize the CCM and its provisions. In particular, the parliament called on all EU members not to adopt, endorse or subsequently ratify a possible Convention on Conventional Weapons (CCW) Protocol allowing for the use of cluster munitions which would not be compatible with the CCM. Cluster bomb survivor Ta with examples of the weapons that maimed him. Photo by Stanislas Fradelizi. Imagine growing up in a country where the equivalent of a B52 planeload of cluster bombs was dropped every eight minutes for nine years. Then imagine seeing your children and grandchildren being killed and maimed by the same bombs, three decades after the war is over. Welcome to Laos, a country with the unwanted claim to fame of being the most bombed nation per capita in the world. Between 1964 and 1973, the U.S. military dropped more than 2 million tons of explosive ordnance, including an estimated 260 million cluster munitions – also known as bombie in Laos. To put this into perspective, this is more bombs than fell on Europe during World War Two. The U.S. bombing was largely aimed at destroying enemy supply lines during the Vietnam war which passed through Laos. The war ended 35 years ago, yet the civilian casualties continue. According to aid agency Handicap International, as many as 12,000 civilians have been killed or maimed since, and there are hundreds of new casualties every year. Take Ta, a father of seven who lives in a remote village in Khammoune Province in southern Laos. One morning four years ago, he saw something that looked like a bombie. He knew it was dangerous, but he had also heard that the explosive inside could be used for catching fish, so he decided to touch it with a stick. That one small tap cost him both arms and an eye. Ta had to travel nine hours to get medical help. He sold his livestock to pay hospital bills, and when he ran out of things to sell, he went home. Ta says he had to ‘eat like a dog’ for four years, before non-governmental organisation COPE provided him with prosthetic arms. Now he is able to help in small domestic chores. Then there is 31-year-old Yee Lee. He was digging around in his garden in August when suddenly his hoe came down hard on a bombie. He lost both legs and two fingers. Unfortunately, most survivors are unable to continue physical work, even if, like Lee, they receive free treatment and prosthetic limbs from agencies such as COPE and World Education . A prosthetic leg that can last up to two years costs as little as $50, yet in a country consistently ranked one of the region’s poorest and where almost 30 percent of the population live on less than $1 a day, this is more than most families can afford. Worse, loss of a breadwinner means loss of income and increased poverty. Cluster bombs are dropped by planes or fired by mortars. They open mid-air releasing multiple explosive sub-munitions that scatter over a large area. These bomblets are usually the size of tennis balls. Aid agencies say the indiscriminate nature of these weapons and the fact many bomblets fail to go off mean they have a devastating humanitarian impact. On December 3 this year, over 100 nations will sign an international treaty to ban the use of cluster bombs. In Laos, it’s thought that around 30 percent of bombies failed to explode on impact, leaving about 80 million live munitions lying on or under the soil which has posed a serious threat to people’s lives and livelihood. So far, fewer than 400,000 bombies have been cleared, a meagre 0.47 per cent. The United Nations estimates almost half of all cluster munition victims are from Laos. Even with community awareness programmes run by national authority UXO Laos, with support from numerous aid agencies, the injuries and deaths continue. Sometimes people touch the bombies out of ignorance, other times it’s out of curiosity (children) or for economic reasons (adults). With scrap metal going at $1 to $3 a kilogramme, some people collect war remnants to sell, and this includes unexploded ordnance. In a private foundry on the outskirts of Phonsavanh, the capital of Xieng Khouang, the humanitarian organisation Mines Advisory Group (MAG) sorted through five years’ worth of scrap metal, and discovered over 24,000 live items, including 500 cluster munitions. Xieng Khouang, in northern Laos, is one of the most affected areas – more than 500,000 tons of bombs were dropped here. The mountainous and beautiful terrain is marred by craters of all sizes – locals liken it to the surface of the moon – and littered with metal shrapnel. Children are at constant risk. In a small village school 20 minutes from the provincial capital, 248 bombies were found in a 4,200 sq metre area. The province is also famous for the Plain of Jars – a vast plateau of ancient stone jars whose origins remain a mystery. But the amount of war debris scattered between the giant jars has seriously hampered archaeologists’ efforts to find out more about them. More than 100 nations have reached an agreement on a treaty which would ban current designs of cluster bombs. Diplomats meeting in Dublin agreed to back an international ban on the use of the controversial weapons following 10 days of talks. But some of the world’s main producers and stockpilers – including the US, Russia and China – oppose the move. Prime Minister Gordon Brown called it a “big step forward to make the world a safer place”. He announced earlier that Britain would be taking cluster bombs out of service. The final draft of the treaty went before delegates from a total of 109 countries on Wednesday afternoon. Cluster bombs are complex weapons. The following sequence explains its functioning and why bomblets cover a large area. Step 1: The cluster bomb CBU-87 is dropped from a plane. It weighs about 430 kg and carries about 200 bomblets. This bomb can be dropped from a wide range of aircrafts from many different countries. The bomb can fly about 9 miles by itself before the bomblets are released. Step 2: A short time before the bomblets are released the cluster bombs begin to spin. The canister opens at an altitude between 100m and 1000m. The height, velocity and rotation speed determine what area will be covered by the bomblets. Step 3: Each bomblet is the size of a soft drink can. They deploy a little parachute that stabilizes them and makes sure that they descend with their nose down. Each of the bomblets holds hundreds of metal pieces, which can pierce armour. Step 4: Depending on the altitude from which the bomblets were released and on the wind conditions, the bomblets can cover an area of up to 200m by 400 m. When the bomblets explode, they cause injury and damage across a wide area. The blast of one bomblet can cause deadly shrapnel injuries of in a radius of up to 25 metres. This map shows the area of Trafalgar Square, London. It illustrates the radius of the bomblets. One cluster bomb could spread bomblets covering the red area. The green area shows the radius in which the bomblets could cause fatal injuries. Cluster bombs have been used in countries including Cambodia, Kosovo, Afghanistan and Lebanon.They are made up of a big container which opens in mid-air, dropping hundreds of smaller individual sub-munitions, or “bomblets”, across a wide area. All politicians around the world should be “Urged” to sign and ratify this Treaty. Don’t hesitate to give your “Government” a call or e-mail them. Some times a bit of encouragement is needed. One the young children at the therapeutic feeding center at the MSF-run Gondama Referral Center in Sierra Leone. I was a reconnaissance officer in the British army in the Kosovo conflict of 1999. As such, I was the eyes and ears of my commanders, send ahead to give them information about what their main formations might encounter as they advanced. As the Vanguard, we thought we were doing a tough job, but on ­numerous occasions we would run into a hut or shed in the middle of nowhere with a queue of civilians waiting to see the doctor inside. These doctors and nurses from all over the world were volunteers for Médecins Sans Frontières (MSF), and selflessly risked their safety to bring medical attention to the civilian victims of man-made or natural disasters. In a celebrity-obsessed world, I clearly remember thinking that these are the people who should be celebrated. Today in the Democratic Republic of Congo, Médecins Sans Frontières teams are working to meet the immense humanitarian needs of hundreds of thousands of people who have been displaced by renewed fighting in the North Kivu ­region of Eastern DRC and are living in extremely precarious conditions. The teams are providing water and sanitation services, life saving surgical support, and primary medical care to people injured in the fighting or who have been uprooted and have fled for their lives. Even at a time of financial crisis, people uprooted by war and conflict and those affected by disease and malnutrition remain just as vulnerable and in need of assistance. That is why it is vital that we maintain support to those in desperate need right now. Doctors Without Borders relies on the generosity of individuals to carry out its essential life-­saving work. Metro followed Médecins Sans Frontières onsite as the organization works to improve the ­conditions for those living in Sierra Leone, one of the worst countries to live in, according to the United Nations. “This is what I wanted to do for a very long time,” says Monica Thallinger. It’s the 29-year-old Norwegian pediatrician’s first MSF mission. Malaria is just one of the diseases she never treats back home, and child mortality at the Gondama Referral Center outside Bo is much higher. Here, two or three children die every day as many parents wait too long to seek help. By then it’s often too late. “Back home a child dies very seldom, so it’s quite tough,” Thallinger says. Even though many traditional doctors have seen the number of clients dwindle since MSF started providing free health care, it happens that patients come in with two conditions — even though it ought only be one. A young girl is treated for malaria in MSF’s intensive care unit at the Gondama Referral Centre. Her condition is aggravated by herbs given to her by a traditional doctor. The case is far from unique, says MSF doctor Monica Thallinger. In Sierra Leone, malaria is the main cause of death among children under five. Statistics compiled by the World Health Organization (WHO) explains part of the reason: only 5 per cent of children under five sleep under an insecticide-treated net. The percentage is higher around Bo, where MSF has provided communities with 65,000 insect nets. A survey done last year in the area where MSF operates shows two-thirds of children sleep under nets. Also, under-five mortality decreased by two-thirds in 2007 compared to the previous year. Malaria is a child killer. Out of an estimated 1 million malaria deaths in Africa, 900,000 occur among children under the age of five. It is also a disease of poverty — and a cause of poverty. The WHO estimates that malaria costs Africa $12 billion US annually. Breaking this evil circle is as easy as breaking the life cycle of malaria. There is no vaccine, but insecticides, mosquito netting and medicines are part of the ­solution. However, the GDP per capita in Sierra Leone is only $600 US and health expenditure is just over 3 per cent of the GDP — $20 US per person per year — and those without access to adequate health care have to find other ways. Those living around Bo are better off as MSF provides free health care for children and expecting mothers. MSF volunteer Mohamed Sandi tests a child for malaria. Mohamed Sandi, a carpenter, rips open a packet of latex gloves, dons them and pricks the finger of Massah, a two-year-old girl with a fever. A droplet of blood is placed in a paracheck, a malaria test kit similar in appearance to an off-the-shelf pregnancy test. He keeps looking at his battered digital watch. ”She’s positive,” he says after 15 minutes. By then Massah has forgotten the sting of the lancet and snatches the foil-enclosed strip of anti-malarials from Sandi’s hand as if they were sweets. Sandi is one of some 140 community malaria volunteers (CMV), trained by Médecins Sans Frontières (MSF) to diagnose and treat malaria. He also knows which patients to refer to a clinic, among them pregnant women. “Sometimes a person is very weak and at times they are bleeding from their nose and I send them to the clinic,” he says. By the end of next year the number of CMVs will double to nearly 300, as the project has been highly successful. Anyone can be a CMV as long as they are committed and literate — writing journals and collecting statistical data is a vital part of the job. In return for their voluntary work, other villagers supply the CMVs with food and help them tend to their gardens. The most severe cases end up at the Gondama Referral Centre, an MSF-run hospital outside Bo, the second largest city in Sierra Leone. The GRC provides free health care for children and expecting mothers. “A Cesarean section at the government hospital is 100 dollars and it’s impossible for the patients to pay,” explains Noemie Larsimont, the Belgian doctor responsible for the GRC. • Burma. Humanitarian aid is limited in Burma since the military seized power in 1962. Despite enormous needs there are few relief organizations that work in the country. Only a small amount of the regime’s budget is allocated to health care. • Central African Republic. The political crisis has caused a collapse of the health care system. Poor living conditions cause illnessess. • Colombia. After more than 40 years of civil war with the military more than 3 milion people have fled their homes. Children are forced to be soldiers. • Democratic Republic of Congo. One of the world’s poorest countries. Several hundred thousands have fled their homes the last year. The Congolese have a high prevalence of malnutrition and malaria. • Somalia. The country has lived through chaos for 15 years. But the humanitarian aid has decreased. Violence makes the situation difficult for aid organisations. • Sri Lanka. The conflict between the government and Tamil rebels LTTE has struck hard against the civilian population. Bombings, mines and suicide attempts are everyday events. • Chechnya. The Caucasus is still unstabile after the war against Russia. There is shortage of basic health care. • Zimbabwe. Political instability, inflation and shortage of food has weakened the country. Three million people have fled the country. Prospects for the future are not good, medical staff is leaving the ­country. • Malnutrition. Every year five million children under the age of 5 die from malnutrition. Despite new forms of treatment, starvation is still an enormous problem, especially in Africa. • Tuberculosis. Every year 11 million people are infected with tuberculosis. Two million die from the disease. Most victims live in poor countries without sufficient health care. Dozens of Afghan civilians are dead and dozens more are wounded after a series of air strikes aimed at Taliban fighters fell short of their target and exploded in the middle of a wedding party in a mountainous region north of Kandahar city, tribal elders and wedding guests told The Globe and Mail on Tuesday. Survivors of the attacks, which occurred in the village of Wech Baghtu in the district of Shah Wali Kowt on Monday evening, said the majority of the dead and injured were women – the bombs struck while male and female wedding guests were segregated, as is customary in Kandahar province. They said the bodies of at least 36 women have been identified, and hundreds more men and women have been injured. Local leaders have yet to establish a firm casualty count because many of the victims remain buried beneath rubble, said Abdul Hakim Khan, a tribal elder from the district. In interviews at Mirwais Hospital in Kandahar city, where at least 16 male victims and dozens of female victims were being treated Tuesday night, several villagers described the attack. While Mr. Khan corroborated much of the information witnesses gave during a separate interview, it was not possible to independently verify their account or the numbers of dead and injured they gave. Witnesses gave conflicting statements about the identity of troops who arrived at the scene after the air attacks, with some saying they saw Canadian soldiers while others said they saw U.S. troops. It was not immediately clear which international forces were responsible for the air strikes. A Canadian military source denied that Canada, which has responsibility for Kandahar province, had any involvement. “Task Force Kandahar has not been in any significant military engagement in Shah Vali Kowt in the last two days,” the source said. The sparsely populated mountainous region surrounding the village is a known Taliban stronghold. In the past the area has been a target of various anti-insurgent special operations. Mr. Khan said his village is situated at the foot of a mountain frequented by Taliban insurgents. At the time of the wedding, insurgents on the mountain had attempted to attack troops in the area with an improvised explosive device, Mr. Khan said. Fighting broke out between troops and insurgents after the Taliban began firing from the top of the mountain, which triggered the air strike, he said. Abdul Zahir, 24, the brother of the bride, said fighting broke out between Taliban and international troops near a crossroads in the village early on Monday. Wedding guests first heard shots from the mountain about 4 p.m. Air strikes followed about half an hour later and lasted about five hours, he said. While Mr. Zahir was not injured, his sister was severely hurt, as were three of his young cousins, Noor Ahmad, Hazrat Sadiq and Mohammad Rafiq, who range in age from three to five years old. During the interview, they lay sprawled out next to him on tiny hospital cots. Mr. Zahir said that in all eight members of his family were killed, including two of his brothers, Qahir and Twahir, and his grandmother. Fourteen other family members were injured. The bombing wasn’t the end of the ordeal, witnesses said. When the air strikes were over, they said, international troops arrived in three sand-coloured armoured vehicles. Villagers reported they were intimidated and prevented from leaving to seek medical treatment while the soldiers took pictures. The governor of Kandahar province will hold a press conference on the incident Wednesday morning, a spokesman said. “We are collecting information right now about this incident. It’s not complete,” the spokesman said. Taliban insurgents in a remote village northeast of Kandahar provoked an attack by coalition troops that devastated a wedding party on Monday and resulted in dozens of civilian deaths, the top politician in Kandahar has told The Globe and Mail. Ahmed Wali Karzai, chairman of Kandahar’s provincial council, said he and his brother, President Hamid Karzai, were told by villagers during a teleconference on Wednesday that between 300 and 350 Taliban fighters invaded Wech Baghtu, a mountain village in the district of Shah Wali Kowt, 60 kilometres northeast of Kandahar city, during the lead-up to a wedding ceremony. Inside the village, insurgents stationed themselves on rooftops, including those of homes that were holding wedding events. From there they began firing rocket-propelled grenades at a convoy of four military vehicles, Ahmed Karzai said he and his brother were told. The troops retaliated on a massive scale, killing and injuring dozens of villagers, including several family members of the bride and groom. The precise number of casualties has yet to be determined, but figures reported by witnesses and district leaders range from 38 to 90 dead. As of Wednesday, about 50 victims, most of them women, had checked into Mirwais Hospital in Kandahar with serious injuries, including burns and severed limbs. Some with more severe injuries were taken to Quetta, Pakistan, district elders said. It remains unclear from reports gathered from survivors whether troops launched an air strike or a mortar attack on the village. Women who were helping the bride plait her hair before the wedding told a Globe researcher they remembered hearing shooting, but they blacked out when bombs struck the mud-walled home. When the women awoke, they said, they were with the bride in hospital. While none of the coalition forces fighting in Afghanistan has taken responsibility for the attack, the U.S. military and the Afghan Ministry of the Interior announced a joint investigation into the incident. Although Canadian troops are responsible for Kandahar province, the Canadian Forces is adamant about its lack of involvement in the attack, which came to light late Tuesday after victims began arriving at Mirwais Hospital. Major Jay Janzen, a spokesman for the Canadian military, said troops occasionally patrol the district centre of Shah Wali Kowt, but they rarely venture the 20 kilometres north to the village that was attacked. At an afternoon press conference Wednesday, Rahmatullah Raoufi, the governor of Kandahar, identified U.S. forces as the troops involved in the attack. He also said the troops called in an air strike on the village in response to enemy fire. His office is still working to confirm numbers of casualties. In the meantime, Ahmed Karzai and the President said they have dispatched a team of trusted elders from the Shah Wali Kowt district to conduct a separate investigation. Ahmed Karzai said the attack is a sign of the Taliban’s increasing reliance on terrorist tactics to turn locals against the government and coalition forces. The issue of civilian casualties has been an increasing point of friction between Afghan government officials and coalition forces. Between 2006 and 2007, there was a three-fold increase in civilian deaths from aerial attacks, according to a report released in September by the New York-based group Human Rights Watch. The deaths are largely due to unplanned air strikes called in by U.S. forces, said the report, which put the number of civilian deaths due to air strikes at more than 300 for 2007. This year, the use of air power has increased. During the past three months alone, more than 100 civilians have died in unplanned air strikes in southern Afghanistan, including at least 17 in Helmand province two weeks ago and 90 in Herat in August. A U.S. military investigation into that raid acknowledged the death of only 33 civilians. Ahmed Karzai acknowledged that Afghan security forces have been hard-pressed to counter insurgents in the remote areas where militants control swaths of land and frequently exploit villagers to provoke attacks. He said that locals in rural Shah Wali Kowt rely mainly on police for protection, but their ranks are thin. “The police have a problem there. They aren’t really able to control the area,” he said. “The job of the police is to maintain law and order. “They are not trained to fight guerrilla war. That’s the job of the military,” he said. Problems are compounded by the poor economic state of the region, which suffered further in Monday’s attack when farm fields were destroyed. In recent presidential debates, Senator John McCain has said things like, “I know the veterans. I know them well. And, I know that they know that I’ll take care of them.” It was stunning, because nothing could be further from the truth. It’s something that our friend Charlie Fink even made an issue of in his new video at Lunatics and Liars. A lot of you have asked VoteVets.org to explain why Senator McCain gets consistently low ratings from veterans groups. Below is a full list of votes, statements, and positions of Senator McCain’s, which shows that Senator McCain has consistently bailed on troops and veterans. It’s a very long, but comprehensive list. I encourage you to take a look and pass it around. An even more robust list, complete with video, can be found at VetVoice.com, as well. · Veterans Groups Give McCain Failing Grades. In its most recent legislative ratings, the non-partisan Disabled American Veterans gave Sen. McCain a 20 percent rating for his voting record on veterans’ issues. Similarly, the non-partisan Iraq & Afghanistan Veterans of America gave McCain a “D” grade for his poor voting record on veterans’ issues, including McCain’s votes against additional body armor for troops in combat and additional funding for PTSD and TBI screening and treatment. LAUER: If it’s working, senator, do you now have a better estimate of when American forces can come home from Iraq? McCAIN: No, but that’s not too important. · McCain again confused Sunni Muslim al Qaeda operatives with Shi’a Muslim insurgents. The Washington Post reported of McCain: “He said several times that Iran, a predominately Shiite country, was supplying the mostly Sunni militant group, al-Qaeda. In fact, officials have said they believe Iran is helping Shiite extremists in Iraq. MCCAIN: Do you still view al Qaeda in Iraq as a major threat? MCCAIN: Certainly not an obscure sect of the Shi’ites overall? MCCAIN: Or Sunnis or anybody else. · McCain incorrectly thought General David Petraeus was in charge of Afghanistan. The Army Times reported: “Speaking Monday at the annual meeting of the Associated Press, McCain was asked whether he, if elected, would shift combat troops from Iraq to Afghanistan to intensify the search for al-Qaida leader Osama bin Laden. ‘I would not do that unless Gen. (David) Petraeus said that he felt that the situation called for that,’ McCain said, referring to the top U.S. commander in Iraq. This man it seems would not protect our men and women who risk their lives every day. Know who your voting for. I would never vote for this man. I love my troops too much to leave them in his hands. The majority of the money in 612 billion budget for defense goes to contractors etc. The majority goes to the profiteers of war and there are many. Not for the troops or the veterans. Very little actually is used to take care of them. One can decide what they will but, always consider the running record of any candidate. McCain’s record in this area is rather bleak. One would think of all the people, he would understand, the needs of these ones the most. But he doesn’t. If he can’t fathom the needs of troops and veterans, I am afraid he would never be able to lead the American people into a new and brighter future. But that’s just my opinion. Would you want the lives of you children, brothers, sisters, uncle, aunts, families or friends left in his hands? That is the ultimate question we all have to ask ourselves. Anyone who has had an adversarial relationship with John McCain will tell you that there are few with less self-control than the senator from Arizona. Many have questioned his ability to maintain a clear head in a time of crisis. For those of us who have seen these sparks of insanity from McCain, we know all too well that what lies beneath is something dark, ominous and certainly not presidential. John McCain makes reference to his service to our great nation by almost daily reminding us of his five and a half year captivity in the Hanoi Hilton. Yet few have been able to look beyond McCain, the POW, to examine his political record, as if it were taboo somehow to be critical of a former prisoner of war. But what about this former prisoner of war and his criticism of the very same people who fought to bring him home from the dark dank cell he likes to remind us about so much? – The POW/MIA Families of those less fortunate than McCain, those who still have yet to be returned to the soil they gave their lives for. ~Dismantled protection to any future servicemen that go missing. Blasts were heard and ambulances streaming out of the centre of Montenegro’s capital as pro-Serb demonstrators clashed with police during a rally against Montenegro’s recognition of Kosovo’s independence. The protesters chanted “Treason! Treason!” and “Kosovo is Serbia!”, as opposition leaders gave Premier Milo Djukanovic a 48 hour deadline to annul the recognition of Kosovo, or face a referendum on the issue. Both demonstrators and police officers were among the injured and witnesses saw a number of ambulances taking the wounded to a nearby hospital. It is not clear what exactly triggered the clashes, but the violence broke out as protesters marched by the government building, reportedly throwing firecrackers and molotov cocktails towards the police cordon which was securing the area. Demonstrators also demolished the fence around the government building, and police responded by firing the tear gas into the crowd. In addition, police helicopters hovered over the centre of Podgorica. Police have made at least a dozen arrests. Following the violence, protesters dispersed across the capital but sporadic clashes were still being reported. Miodrag Vukovic, a high-ranking official from the ruling Democratic Party of Socialists, blamed the incidents on the opposition, saying their political rivals have chosen a wrong tactic to express their dissatisfaction. “This looks like the 1997 attempt to overthrow the government… But Montenegro has matured since then,” Vukovic said. About a third of Montenegro’s population declare themselves as Serbs, while ethnic Albanians make up around seven per cent of the population of this small coastal republic. Montenegro was also in a loose federation with Serbia up until a referendum on independence in 2006. Podgorica recognized Kosovo`s independence on October 9, leading Belgrade to expel Montenegro’s ambassador. Montenegro’s decision came just a day after the United Nations General Assembly voted in favor of Belgrade’s request for the International Court of Justice to render an opinion on the legality of Kosovo’s unilaterally declared independence in mid-February. The pro-Serbian opposition in Montenegro will hold a rally in the afternoon of October 13, to urge the government to withdraw its decision to recognize Kosovo’s independence, or call a referendum on the issue. Podgorica’s decision to recognise Kosovo as an independent state has seriously disrupted relations between the ruling coalition and the opposition, which has also called for early parliamentary elections. “We want to articulate the popular will on this issue”, the president of the opposition Socialist Peoples Party Srdjan Milic said. He said most Montenegrins do not support the government’s move to recognise Kosovo’s independence. Despite harsh language between the government and opposition over the weekend, local analysts expect the overall situation to remain calm, and both sides have called on their supporters to remain calm. Montenegro’s police chief, Veselin Veljovic, said that police were prepared to prevent any disturbances during the rally. “The organisers have been warned to respect their obligations and responsibilities regarding public order,” he said. Podgorica recognised Kosovo’s independence on October 9, leading Belgrade to expel Montenegro’s ambassador. The trial of the so-called ‘Scorpion’ paramilitary group, who are accused of crimes during the 1998-1999 Kosovo conflict, resumed Monday at Belgrade’s War Crimes Chamber. Zeljko Djukic, Dragan Medic, Dragan Borojevic and Miodrag Solaja are accused of attacking 19 civilians, all women and children, in Podujevo on March 28, 1999. Fourteen people were killed during the attack although five children survived. Six other members of the Scorpion Paramilitary have already been tried and sentenced for the same attack the four are standing trial for now. Scorpion Unit Commander Slobodan Medic was sentenced to 20 years in prison, member Sasa Cvijetin was sentenced to 20 years behind bars, Pera Petrasevic received 13 years, Branislav Medic’s jail term was reduced from 20 to 15 years, Aleksandar Vukov was cleared of all charges and Aleksandar Medic, who was originally sentenced to five years, was granted a retrial by the court. Brussels _ The EU has urged Serbian officials to be constructive over Kosovo, especially in regards to the deployment of the bloc’s EULEX law and order mission. “It is important that we all, including the Serbian government, work towards making EULEX’s deployment a success, and in this regard we expect a constructive approach”, said the bloc’s Enlargement Commissioner, Olli Rehn. “After the vote at the United Nations General Assembly, the result of which was no drama or no surprise, it is now important that we all work in order to ensure overall regional stability and the enhancement of rule of law in Kosovo and elsewhere in the region,” he added. This was the commissioner’s response to the latest message from Serbian President Boris Tadic that they would cooperate with the mission but only under certain conditions. In the interview for Belgrade daily Vecernje Novosti, Tadic emphasised that Belgrade would condition the European mission’s presence in Kosovo on a green light from the UN Security Council, ask the current United Nations Mission to retain its neutral stance towards the status of Serbia’s former province and, last but not least, call for plans to implement the blueprint for Kosovo’s independence devised by former UN envoy and Nobel Peace Prize laureate, Martti Ahtisaari, to be dropped. Rehn also reminded Serbia’s politicians that good neighbourly relations are of outmost importance under a EU pre-membership deal called the Stabilisation and Association Agreement, which Belgrade signed with Brussels at the end of April. “We underline the importance of overall regional stability, and for that it is important that Serbia has a constructive approach to the Kosovo issue and the deployment of the EULEX mission which aims to ensure stability in Kosovo and the region, and citizens rights and rule of law for all the citizens of Kosovo,” Rehn said in Brussels. Rehn earlier met Serbian deputy prime minister Mladjan Dinkic on Thursday to whom he congratulated the decision of the government to unilaterally start the implementation of trade-related parts of the Stabilisation and Association Agreement. According to Rehn, this will be very useful in building a convincing track record when Serbia gets EU candidate status. Belgrade _ Serbia’s President Boris Tadic says a compromise with Brussels is possible over the deployment of the European Union’s new law-and-order mission to Kosovo. Tadic said Belgrade wants to find a compromise to the deployment of the 2,200-strong European Union mission to Kosovo, known as EULEX but with blessing of the United Nations Security Council. The world’s top security body remains divided on the issue since veto-wielding member Russia, strongly backs Serbia’s territorial integrity and has previously echoed Belgrade’s concerns that EULEX seeks to formalise Kosovo’s independence. “We are working on that in all international forums, with the UN Security Council and the EU, with officials from Russia and the United States, with everyone who is vitally important in the future of Kosovo and Serbia,” Tadic told Belgrade daily Vecernje Novosti. However Tadic emphasised that Belgrade would condition the European mission’s presence in Kosovo on a green light from the UN Security Council, ask the current United Nations Mission to retain its neutral stance towards the status of Serbia’s former province and, last but not least, call for plans to implement the blueprint for Kosovo’s independence devised by former UN envoy and Nobel Peace Prize laureate, Martti Ahtisarri, to be dropped. “Anyone who finds fault with these principles has a problem with logic. There are political parties that are trying to fool Serbian citizens and ‘guarantee’ that EULEX will implement independence in Kosovo. We are going to fight to make sure that does not happen,” Tadic said. The move towards a compromise between Belgrade and Brussels was also signalled by the EU’s special representative in Kosovo, Pieter Feith, who said that “recent consultations” between Serbia, the EU and New York opened the possibility for a widely acceptable solution for EULEX. “There is a possibility that consultations between Belgrade, the EU and New York result with some kind of solution and the UN’s authorisation for EULEX. But I believe there is no real need for that,” Feith said, adding that the EU looks forward to cooperation with Belgrade on the matter soon. The positive signals followed warnings from international think-tanks such as the International Crisis Group that divisions between Kosovo’s ethnic Albanian majority and some 100,000 remaining Serbs have widened following Kosovo’s unilateral declaration of independence from Serbia on February 17. EULEX is due to become the main international body in Kosovo, although its powers will be largely supervisory – particularly relating to the fields of policing and the judiciary. But EULEX’s ability to fully deploy some eight months after Brussels okayed its biggest ever security and defence policy operation has given western powers cause for concern. Critically it lacks a mandate from the UN Security Council since Russia has vowed to block any changes to Kosovo’s status which do not have approval from Serbia. Belgrade and Moscow have also used this shortcoming to argue Kosovo’s independence is in fact illegal under international law. Adding to EULEX’s woes is the question of whether it could ever deploy across the whole territory of Kosovo. Kosovo Serbs, particularly those living north of the River Ibar, where they make up a majority, have so far defied Kosovo’s independence thanks to political and financial assistance from Belgrade. They are also likely to put up stiff resistance against the EULEX mission. “UNMIK remains our only legitimate partner in Kosovo,” Serbia’s Minister for Kosovo Goran Bogdanovic said, rejecting the EU’s announcements that its mission will be fully operational by December on the whole territory of Kosovo. The UN mission has tried to take up Serbia’s concerns by opening up direct negotiations on local governance in Serb-dominated areas of Kosovo. Such talks are to focus on areas such as police, courts and customs but little progress has been made so far. October 16 2008 Belgrade _ Serbia’s government has unanimously backed a move to begin implementing reforms outlined in a key pre-membership deal with the EU despite the bloc having frozen the agreement. Serbia hopes that by unilaterally taking up the key reforms prescribed in the Stabilisation and Association Agreement, Belgrade will be able to become a European Union candidate once the deal is unfrozen. “The main goal is to shorten the time between implementation of the agreement and Serbian candidature for EU membership,” Premier Mirko Cvetkovic said after the open session of the Serbian government. The parts of the key agreement with the EU will be implemented immediately but the rest of package, including new, lower custom taxes on the import of cars, will come into force from January, Serbian officials said earlier. European officials have urged Serbia to begin implementing the deal unilaterally, despite the fact that there has been no EU consensus on backing Belgrade’s drive for membership. Only one country, the Netherlands, has opposed ratification of the interim trade agreement with Belgrade. The main reason behind such a stance according to the Dutch Foreign Minister Maxime Verhagen, was Belgrade’s failure to arrest and extradite to The Hague the former military chief of Bosnian Serbs, Ratko Mladic, wanted for genocide and war crimes committed during the 1992-1995 conflict. Serbia’s pro-European government has made EU integration its key priority. EU officials earlier signalled that Serbia could achieve candidate status next year. When the Serbian parliament ratified the Stabilisation and Association Agreement last month, the hardline opposition Radical Party, which has traditionally opposed EU membership, abstained from voting, a move which may signal the emergence of a greater national consensus on Serbia’s European objectives.